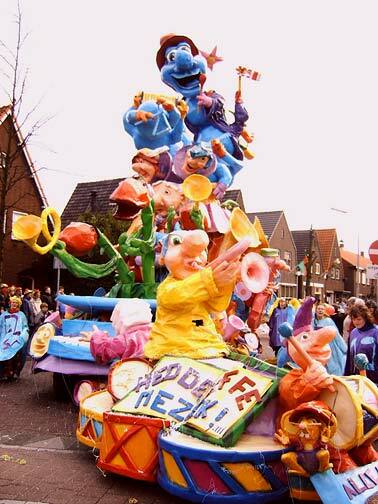 Carnival Parade Float in Oosterhout, The Netherlands. Coni is officially done with Round One of chemotherapy. Her last IV bag was finished around 1:30 Friday afternoon (February 24) and they removed her PICC line, so for the first time since the previous Tuesday, she was not connected to a tube leading to a bag of chemicals. After she got the PICC line taken out, we took the Metro (subway) to downtown Washington. We didn't spend much time sightseeing, but we did see the White House, Washington Monument and the Capitol Building. Hopefully next time out here our schedule won't be as full, so we'll have more time to check out the city. She was still feeling pretty good. The doctors and nurses told us she would likely feel more side effects the next week; the following week they should decrease again. On Saturday we had to make one more stop at the NIH for Coni's Neulasta injection, to cause her bone marrow to produce more white blood cells, to help her immune system. But the funny part is the nurse made ME give Coni the injection, because next time she will need it after she gets home. So either she will have to give herself injections or I'll have to do it for her. I think she was nervous about me giving her a shot. I told her I had given shots to cattle and pigs on the farm, but that didn't seem to help. Luckily, it was a very small needle and it went OK.
After the injection, we were on our way to the airport. Coni and I arrived back in the Cities about 4 p.m. Sunday. Coni spent this past week resting at home. Her mom came down from Osakis to keep her company, help her cook meals and generally do what moms do when their children are sick. I have been working 12 hour days to make up for being gone last week, while Coni has been feeling the side effects of her chemo treatments, including soreness, tiredness, etc. She had her first blood test on Thursday, and while some of her blood counts are down (which is to be expected), none of them were out of the ordinary or in the "danger zone." Her doctors told her that her levels should start to increase over the next few days, so this coming week she should feel more energetic. She will have blood tests done every Monday and Wednesday, to make sure everything stays normal until she heads back to Maryland for Round Two on March 14th. Thank you to everyone who has kept us in your thoughts and prayers, and please continue to do so this week as the chemotherapy does its job! UPDATE -- our Miss Betty -- 76 years young! 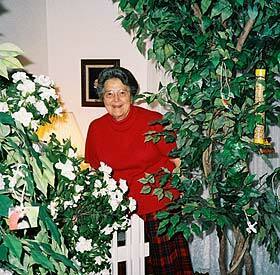 Garden theme sets tone for Betty Droel's birthday party picnic. I can hardly wait to tell you about the birthday I enjoyed yesterday. IF you can enjoy a 76th one. That is getting very old, if you ask me. 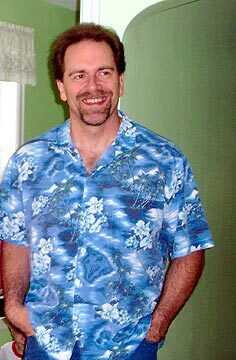 My brother Rich, and Verlaine, sent a formal invitation to come to their home Wednesday evening at 6 o'clock for a birthday party. Well, it was March 1st, so of course I assumed it would be mine. I was pretty excited, as they are so original and go all out in so many ways for their granddaughters' birthdays, so I dared hope it would be a fun one. Steve, Marci, Shalana and Krista were also in on it. 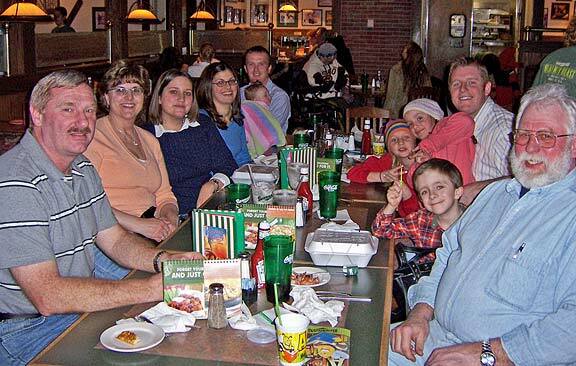 That is, my nephew (Rich and Verlaine's son) and his family. I didn't realize they had been planning this grand affair together for days. Well, we made sure we walked in right at 6. It was quite dim in the living room, and they were just taking Marci's beautiful lasagna out of the oven. They ushered Roy and me into the living room. To our shock and surprise, here it was all re-arranged to look like an outdoor garden party. 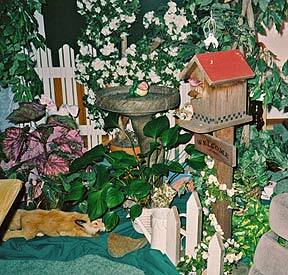 They had artificial trees, plants, rocks, birdbath, birdhouses, and birds everywhere you looked. Also, bird songs in the background and frogs croaking on a CD. It was astounding! They had white picket fence like a walkway, and a green, grass-like carpet. The girls had headbands on, one like a cat and one like a rabbit, and they were hiding in the "woods" to scare us when we walked near. You can see them in the picture. 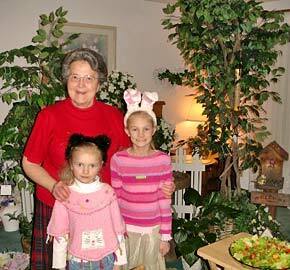 Krista (cat) & Shalana (rabbit) with Aunt Betty; Krista & tulips, right. The table was their picnic table and benches from the deck, set with bright paper plates -- everything possible to resemble a picnic in the woods or garden. 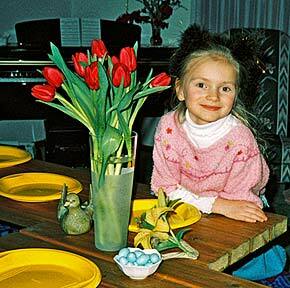 My 6-year-old great niece, Krista, had picked out a fresh bouquet of tulips in a lovely vase with her own money. That I could hardly imagine, as money is pretty valuable to little girls, but she insisted that would be her gift. Shalana, who is 9, picked out a lovely bird candle holder, and both will be keepsakes I love. We had a luscious, green vegetable salad, Italian cheese bread, and lasagna, then cupcakes with a plastic bird on each one for dessert. The girls had cut out paper birds, and even made some paper birds and had them hanging in the trees and from the ceiling fan. It must have taken them hours to do it all. 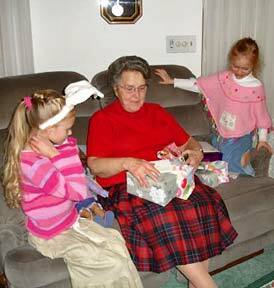 There was a whole pile of gifts, and very useful ones like candy and general everyday needs, like cornbread mix, table napkins, and hand cream, etc. I will send some pictures, and hopefully you can enter into our wonderfully happy and unique birthday party. 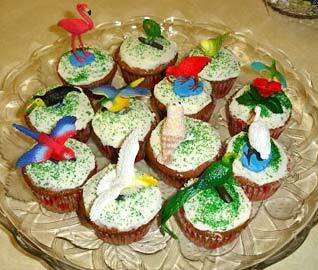 Betty & Roy Droel at picnic supper; cupcakes with birds for dessert, right. I don't want this to be so long the editors will not be able to print it, so I had better stop here. Had to share my special celebration, though, and now wait to hear yours. Grandpa's shop looks pretty nifty. I wish we had that much space to do our projects in! It is getting warmer here -- 73 degrees yesterday and that felt great! We sure would like some rain, though. We haven't gotten any rain since the first weekend in October, so it is SUPER dry down here in the Southwest. We are expecting a lot of forest fires this summer. That means no campfires for us this year on our camping trips. Ryan and I both took off this Friday and we are planning to go to Durango, Colorado, to go skiing. We might even stop over at Angel Fire, New Mexico, to ski there on Saturday. It will be a nice break from work. Hopefully there is some snow left! We will send you pictures when we get back. Well, I am writing this at work and I should probably try to find something to do. It's been pretty slow the last few days. So I will talk to you again, soon. Dinner with Jessy, clockwise from left: Mahlon & Myrna Schweigert, Jessy Wolfe, Marcy, Mike & Emma Jorda, Jeanette Evavold, Caity, Chris & Jayce Chap, Beaver Johnson. We had the fun of meeting Jessy's folks last weekend. Great people and we had a very nice visit, although too short. I would have loved to have gone along to Kohl's for shopping afterwards! Jayce, Caity and her friend Jeanette Evavold, Beaver and I arrived a few minutes late (after a Sam's trip). 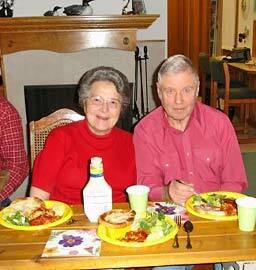 We were introduced to Jessy's mother, Myrna, and her husband, Mahlon Schweigert. 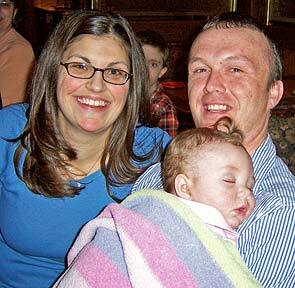 Jessy's sister Marcy and husband Mike were also there, along with their baby, Emma, so we finally got to meet Emma. 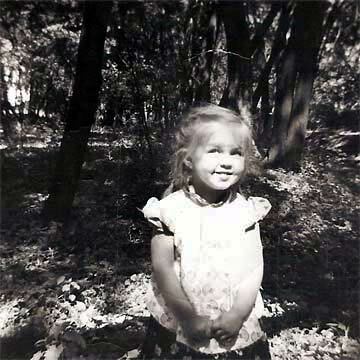 I've admired many of her pictures before; she's a little doll. I got to hold her at the end of the meal and Jessy had her chuckling so cute that it had all of us laughing! I did find out that Myrna can be a sneaky woman, though. She picked up the tab while I was distracted and would not let us pay for anything except the tip. Well, really she's a sweetie, but we did not expect her to do that! Jayce got a chance to visit his friend Darren Shores. (They go to school together and Darren came here for day care when they were younger.) They had a great day together. 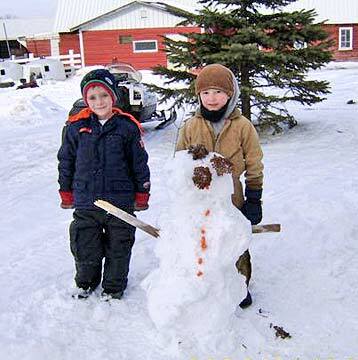 Jayce, left, and Darren, right, built this fine snowman. Those pictured, in the left picture, would be great Aunt Elizabeth "Anty" McCalla, her son, Gilbert McCalla and his wife, Marlyce, Grandma and Grandpa Dake and Judy McCalla. Picture on the right is my beautiful cousin Kathleen Dake (now Stahlecker). Editor's Note: Thanks, Donna -- good work and first to have them all correctly identified. The picture on the left, starting with the back row L to R: Aunty Elizabeth, her son Gilbert and his wife, Marlyce. Front row, L to R: Grandma Dake, Judy (Gilbert's daughter), Grandpa Dake. The picture on the right: Kathleen Dake. Editor's Note: Yes, Judy was Gilbert's daughter from his first marriage to her mother, Jean. I was really surprised to find myself looking at ME [Kathleen Stahlecker] in The Bulletin in the Mystery section. I did not realize that picture had even been taken. I am trying to figure out who the culprit was that you got it from. I think that picture was taken the year I graduated (1973) when I flew to Minnesota to spend a week or so. I think Donnie, Larry and I went to Ginny's place on a weekend up near Duluth. I remember stopping and taking a picture of some waterfalls or something and I think that must have been when it was taken. So, who was the culprit that took such a wonderful picture of ME? I have narrowed it down to those three. Of course, I am quite sure you probably can not reveal your sources. I also enjoyed the picture of Carol and me here a while back. I am not sure I had ever seen that picture (when I was a baby). I have the picture of the family and Daddy that was taken on that Sunday that Carol wrote about. I did not realize that Adriana had never seen that one, through the years. It is just a small one I have. I always thought that was such a good picture of Daddy. So typical in the hat, etc. Editor's Note: We thank Ginny Dake McCorkell for supplying last week's "Guess" photos. The people in the mystery photos would be: back row -- Great Aunt Elizabeth, her son, Gilbert McCalla, and his second wife, Marlyce; center row -- Grandma and Grandpa Dake; front row -- Judy, Gilbert's daughter from his first marriage. The right photo is Kathleen Stahlecker. Well, I don't know them all, but that is Elizabeth McCalla (Aunty) and her son Gilbert in back. I don't think I ever saw the one on Gib's left -- and of course, down front are the most important ones! "Mom" and "Dad" Dake, but, again, the gal with them is a stranger to me. Now the other picture -- another unknown, but she looks like a "Dake" -- only a guess! Thanks again for a GREAT Bulletin! The night before the two bands of sheep had come home -- wagging their tails behind them -- and had mixed at the gate (Bulletin #189), the two Peruvian shepherds had been to town with the Mexican-born cowboys. The Mexican cowboys were celebrating the eldest Mexican's birthday at a bar in Burns, 80 miles away. I learned later that some other cowboys at the bar didn't like Mexicans and a fight had ensued. The hireling shepherds had managed to get out and get home by 4:30 a.m., but the ranch boss needed to make a trip to town in the morning, with an interpreter, to retrieve his cowboys from the county jail. So it had been that the sheep had come home that day and mixed at the gate. The shepherds had been nursing their headaches in their sheep camps -- instead of watching the flocks. Domingo, the younger shepherd, confided to me that he didn't like drinking. He said he only liked a little whiskey in his coffee, to get warm. Some days later, the Peruvians and several Mexicans were taken to Nampa, Idaho, to get their Social Security cards. I was left with the sheep for the day. This was my first time to be responsible for all of the sheep, by myself. Sherry drove the truck while I flaked off hay and dumped the bags of supplemental pellets onto the ground in two different hayfields. Then I took one band of sheep out to the distant hayfield, before bringing the other band out to the closer hayfield. I traveled back and forth, about a mile, between the two bands during the day, checking to be sure none came home or wandered away. Checker and I successfully brought the two bands of sheep safely home that night, and into their night corrals. The last task of the day was to run a third, smaller, group of about fifty lame ewes through a footbath. I'd fed these ewes in their holding corral, where they'd stayed all day. Some other men, and I, had sorted off these limpers the day before, when we'd foot-bathed all of the sheep for the first time. Now, I was to begin running the limpers through the footbath on a daily basis. The footbath consisted of plastic troughs set into the working chute. When the sheep were run through the chute, they were forced to run through the water. The bath contained a chemical called copper sulfate. Foot rot was one of the diseases that had been carried into the flock by recently purchased sheep. The boss said, "We bought this disease." When the foot-bathing job was finished for the day, Checker and I would go home for our supper. There had been six of us to run the ewes through the footbath the day before. We'd used a long, orange tarp about four-feet by forty-feet, to help move them from the V-shaped holding pen, into the crowding pens, and then the chute. The tarp had worked like a moving fence, and the sheep didn't challenge it. Now, Checker and I moved this group of limpers into the V-shaped holding pen again. They were frightened by the prospect of running through the water they'd experienced the day before. Having been constructed for large groups of sheep, the V-shaped holding pen was big enough to allow the fifty ewes to run around freely. Checker and I attempted to chase them down the slope into the crowding pens. The ewes were determined not to cooperate. They easily avoided us. When sheep are frightened, they tend to run uphill. (We didn't know that then.) This working facility had been built such that the sheep had to move down the slope, contrary to nature, to enter the chute. The more frightened they became, the more they wanted to run up the slope -- away from the footbath. We started out with great patience, moving them quietly and slowly down the slope. Checker worked back-and-forth, eyeing the ewes. But, lacking the orange tarp and the help of the other men, I was soon clapping my hands, hooting, and hollering. Checker began to nip at their heels. Every time we got them about half way down the slope, an old ewe would put her head up and prance past us -- back to the presumed safety at the top of the pen. All the rest of the sheep would follow her, flooding by us like a great tidal wave. Trying to hold them back was like trying to hold back water with a pitchfork. My patience was wearing thin. Checker and I were trying to be everywhere at once. The ewes clearly had the upper hand in this game, and it was getting almost too dark to see. It was very important to me to prove that I was competent enough to get this task done without the help of the shepherds. However, as the sheep skittered by us again and again, it was becoming increasingly evident that I was defeated! I'd never considered myself a revengeful person, but I was about to learn something about myself I hadn't known before. I lost my cool. If the confounded sheep wanted to be so stubborn, they were going to suffer for it! Checker was quick to catch my mood, and we chased them up against the back fence, into a tight mob. I sicced the dog on them and lit into them myself. After a few minutes of this abuse, several ewes tried to break away and escape from our madness. We chased them back into the mob and continued to hound them. I was about to call off this foolishness when another ewe broke away. This time she escaped us completely. She ran down the slope, through the crowding pen, and into the chute. All the rest of the ewes then flooded past us, even as we tried to stop them. In less than a minute, they'd all "escaped" -- bathing their feet in the process. I have no idea where Father learned the milling business, but I was told that he was a very good judge of wheat. Farmers would bring their wheat to be exchanged for flour. I very well remember seeing him open up the sacks, examine the grain and then tell the customer how much he would have to dock it because of dirt and other defects. He would then figure out a certain number of pounds of flour, bran and "shorts" [a by-product of wheat processing that consists of germ, bran, and coarse meal or flour] that he would give in exchange. There would be a certain portion that was retained for the expense of milling and profit. The surplus flour was put in 25, 50 and 100 pound bags and shipped by railroad to be sold. This had to be hauled by team and wagon the seven miles to the railroad station at Ashby. There were times in the winter when the dirt roads were bad, and it would be impossible to make delivery to the station. In those days the wheat was ground into flour by passing through and between large, flat stones. I was too small to know much about the process. I can just remember seeing my father lying on one of those stones, carefully pecking away with what seemed to be a sharp pointed tool. Undoubtedly, he was re-dressing the surface that had worn too smooth. Later, more modern equipment replaced the old stone process. Minnesota is known as the "Land of Ten Thousand Lakes." Actually, I believe there are over 11,000. The mill was powered by water that came from lakes located at a higher elevation. The water was brought down through an underground flume that came to the surface about 25 feet from the corner of our house. At that point, there was an open tank-like spot where a weir could be dropped to hold the water back when the mill was not operating. Fish (mostly black bass) would gather at this point, and it was an easy matter to get fresh fish anytime, right in the front yard. From this point, the flume continued above ground to the mill that was located at a much lower point. Here the water entered what was called the penstock, at the bottom of which was located the waterwheel that furnished the power. Some years there would be much rain, and the water in the lakes would be high and plenty to keep the mill running. But there were also dry years when the lakes would be too low to furnish sufficient power. It was during one of these periods that a steam engine was installed, and water power was never used again. The milling proved profitable for quite a while, but in time larger mills were built in the cities, and due to the competition, the small ones had to be discontinued. August Miller was born on April 29, 1853, in Germany and is the son of Powell and Elizabeth (Schmitkens) Miller, both natives of Germany. Powell Miller operated and owned a grist-mill in Germany, and followed the vocation of miller until his death in that country. Two of his brothers served in the German army, and were killed in service during the war of 1864. August Miller immigrated to America in 1870, and was first located in Cincinnati, Ohio, but soon removed to Kentucky, where he was occupied as stage driver and at various kinds of labor, for a period of three years, later removing to Illinois, where he was employed for three years as a farmhand. In 1880, one year following the arrival in Otter Tail County, he purchased a small water mill located on the property which he now owns in Eagle Lake township. This mill he fully equipped and operated successfully until 1894, at which time it was destroyed by fire. The stream which ran the mill is an outlet of Eagle Lake. 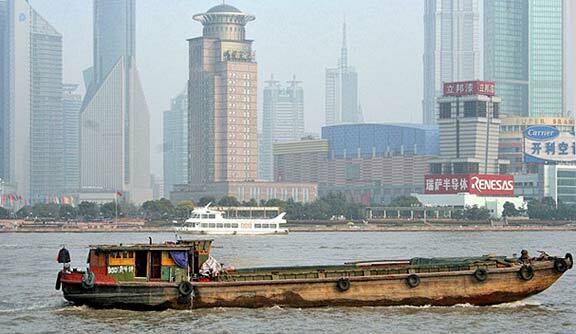 Empty cargo boat on Huangpu River, Shanghai, China. Rainy days in Shanghai make for scarce taxis. Even at a hotel that usually has a dozen taxis waiting for guests to walk out. Thinking about it, I'm not sure I want to ride in a taxi in the rain anyway. They are scary enough when the roads are dry! I couldn't find our second umbrella, either. Which means I probably won't walk anywhere. I'm using the club lounge computer now, to give the maid time to clean our room. I intended, again, to go to Nanjing Road market today. Maybe tomorrow. Not a whole lot to write; today was a blah day. I don't know if it was all the exotic food for dinner last night or the fact that I accidentally swallowed some water in the shower, but my stomach has been in full rebellion all day. Didn't go to the fitness room and didn't go to Nanjing Road market as had been my plan. I did go out for a little while, walked the two blocks to the shopping center. Ate lunch at Pizza Hut; the menu was interesting. Pizza with squid and shrimp, etc. They had American-style pizza as well, supreme and veggie lovers, etc. I decided to get the lunch combo of spaghetti with meat sauce and soup and a drink. The soup was clam chowder, and it was the best clam chowder I've ever had, by far. I told Greg I'd go back just for a bowl of that chowder, anytime. The spaghetti was okay, not great. The drink was my first "fountain drink" since arriving here, I ordered it without ice, in hopes of avoiding tap water bacteria. 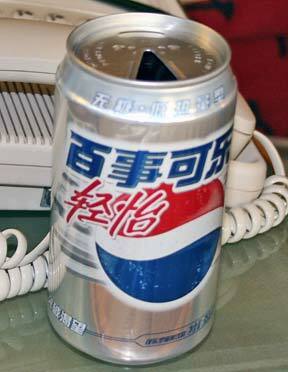 The Pepsi still tasted like the tap water smelled, though. Hopefully it was filtered enough that I won't end up with even worse stomach upset. Then it was back to Carrefours to get Greg a hat and to look around some more. It was much less crowded than our visit the other night, and I wasn't the only American in there this time either. Plus I knew where the cash register was this time, made for much easier shopping. I got Greg a hat for about 12RMB, or $1.50. I also bought a pair of jeans for 79RMB, or a little less than $10. I was hoping to find shorts and T-shirts, but they only had winter clothes out, that I could find. After paying for my items (and it was the same cashier as the other night), I walked back towards the exit. I stopped to look at a counter of watches on the way that was outside the store but inside the building. Timex ladies watches with leather bands for 299RMB or about $40. Men's watches for up to 549RMB or about $70. I then noticed there was more store to the left. Walked around a corner and found individual storefronts or booths. Discovered an up escalator from a basement level, but no down escalator. People, adults and children both, were running down the moving up escalator. Maybe there was no down escalator, I don't know. I didn't feel like fighting the up escalator to go down, nor did I feel like walking around much longer. So I headed back to the hotel, where I took my purchases out of the bag -- to discover the jeans reeked of cigarette smoke. They were new (or at least looked new to me, tags still sewn on for the size and price, etc.) but they smelled horrible. I put them in the hotel laundry bag and tied it off so the room wouldn't smell that way. They get to go to the laundry tomorrow! Greg came home around 6:15 or so and we went to have supper in one of the hotel restaurants. They had a lavish buffet set out with all kinds of meats and seafood, including sushi. But my stomach was still not too happy and my energy level was very low, so we elected to order à la carte. I had half a roasted chicken with steamed veggies and French fries; Greg decided to have a steak. Food was pretty good, and something familiar was nice after the experimentation last night. Then we went up to the club lounge to see what was to be had up there. We came out with little cake squares and bottles of Tsingtao, a locally brewed beer, according to the staff. It's pretty good. And now we're back in our room, waiting for 9:30 to roll around for Greg's regular Wednesday morning 8:30 a.m. call, back in the States. Only it's Wednesday *night* here. 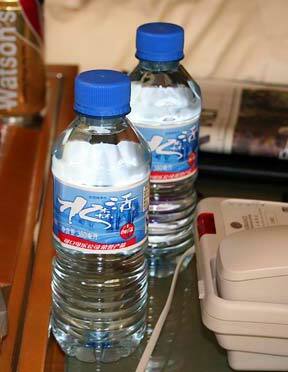 Safer drinks: bottled water by Coca-Cola & Diet Pepsi in a can. Parade group includes Frans's sister-in-law, with Frans's wife, Rian, right. 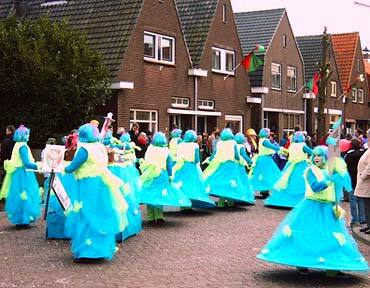 Yes, a Carnival is here (south of the Netherlands). 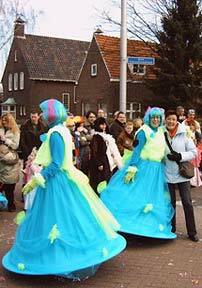 We have had a parade here in my hometown, Oosterhout. 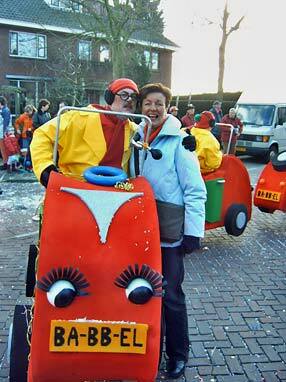 I have made some pictures of some groups and parade-cars. I hope you can use them. As you see, the weather was fine -- cold (+/- freezing), but sunny. 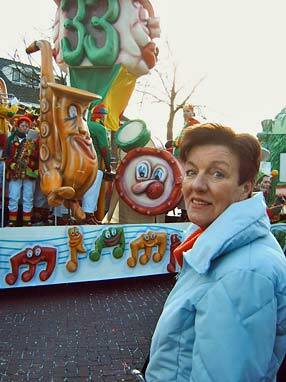 Rian at Carnival parade, left; with band float, right. 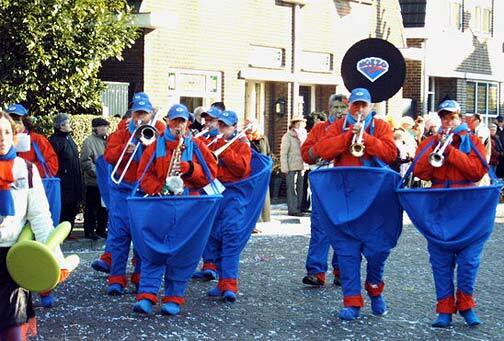 Has this Carnival band been dieting on food from our Skinny Recipes? The troll's favorite diet food! And no wonder! 2. Melt margarine in a large saucepan over medium heat. Add onions and garlic and cook 1 minute. 3. Add flour and cook another minute stirring constantly -- then gradually add milk, then salt and pepper, stirring constantly with a whisk (or fork) until blended. Bring to a boil and cook until thickened (about 2 minutes). 4. Add cheeses; stir until they are melted. Remove from the heat. 5. Add the spinach and macaroni to the cheese sauce, stirring until blended. 6. Pour mixture into a 8x8 inch baking dish that has been sprayed with cooking spray. Sprinkle with bacon bits. 7. Cover with foil and bake at 350 degrees for 15 minutes, or until bubbly. 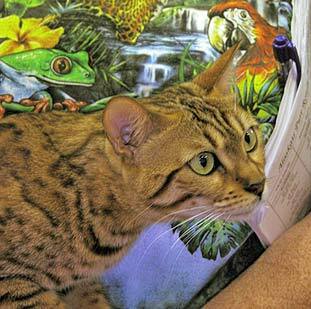 That troll better watch out -- a fierce Bengal cat is watching him! 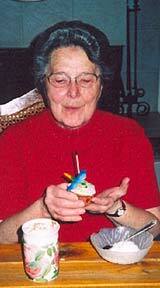 "Miss Betty" Droel opens presents and makes a birthday wish. What a nice surprise, a birthday card online. Thank you for thinking about me. I really am enjoying The Bulletin; it must be a full time job for you to put that all together. If you're wondering how to find an earlier recipe in the Skinny Recipes series, just click on the recipes link in the Menu bar. The link takes you to an index of all The Bulletin recipe collections ... just pick the one you want and click again for a menu. If you're a bit patient while the page is loading, it should scroll down to the recipe automatically when it's done. Or use the search box ... but the search is updated monthly and the menu page weekly. Another interesting edition ... soon will reach the 200th one! Thanks for keeping all of us in touch. I really think I have spring fever now ... looking at Ari's greenhouse makes me just itch to get out and work in the dirt. We are tired of all this ice and snow. While in the local floral shop the other day, I noticed the colors of pots and planters that he shows in his photos. Who ever thought those colors of the 70s ... orange, gold, avocado, would be popular again? But that's the way it happens when one throws them out for the rummage sale, or "give away." I was so happy to see my delivery of The Bulletin in the mail box this morning, and delighted to see the pictures of my great-nephews -- Aiden and Austin Montford. They are just adorable. I wish we lived closer, so I could visit in person. Maybe someday, if I ever sell and get moved. But, then, I read with great sadness the loss of Kurt and Jeni Larson's unborn twins. My deepest sympathy. Next I read the article about Coni, and I felt such hope at how well she is doing, under these difficult circumstances. And, Weston, you are an angel on earth. You both are truly an inspiration to all of us. And the engagement news! How exciting. Something happy to look forward to. Life certainly can be a rollercoaster, can't it? Wow, I shorted out my keyboard by drooling on it after looking at Donnie's recipe and photograph! Yummy! I'll take one for here and one to go! I'm Jack Adair, the other half of Jack and Ginny. I'm the shy one. I really admire the work that goes into The Bulletin, and I wish to become part of the receiving group. I find, in reading it, I do know many of the people, and, through The Bulletin, I'm getting to know more people all the time. We were introduced in Bulletin #189, by our good friend Virginia McCorkell. It's fun to have her and my wife together, and holler "Hey Ginny!" and watch them both turn around. In our introduction, Ginny ... your Ginny ... remarked on my sweater with the guitars. Those depicted on the sweater were my collection, which my daughter Jane got a picture of and painted them on the sweater. Some of those I no longer have, and some new have been added. I will elaborate on guitar stuff in future notes. Again, I love The Bulletin, and look forward to receiving it on a regular basis. Thanks so much. *Note on the nickname: I worked as a security officer for a little over 10 years. I gained the rank of Captain, title of metro area commander. Our dispatcher labeled me with the nickname, which stuck. Plus, I think it sounds nice. We are fine. We finally are having a little bit of winter, but still not enough to get rid of the bugs, etc. for summer. We have had quite a drought going on but have received a little rain the last few weeks that has helped. We had to sell some of our cattle as the round bales of hay were running about $100 a bale and were hard to find. We keep busy with jobs and school. Aaron continues to keep us running with school activities but we are not complaining. He just finished power lifting season and has started track. He did well with the power lifting and has started out well throwing the discus for track. In amongst all of this they are fixing to go for UIL competition for Band so he does not have a lot of lax time. He possibly is going to go on a ski trip with Adriana and Michael during spring break. He has never done this before so hope he does not get hurt. I had my nose surgery for the skin cancer this past Friday. They got it all but did end up having to do a skin graft from my neck to patch up the hole that was left. Hopefully it all heals good. I see the Dr. again on Friday, March 3, to have the stitches, etc. removed from the neck and nose. The girls and families are fine. Keep busy as everyone with jobs and school. Angela may find out in a few weeks what she is having. She is not as sick now as she was for a while. They would love to have a girl, but just want it to be healthy, so we will see. Carol, Harold, Cody and son Austin are coming for a visit the last of March, which we are excited about. It has been a while since we have seen them. I guess since Carol and I flew up to Minnesota for the cousins reunion. I better run. I have some Head Start work that needs to be tended to before tomorrow. Engaged to be married. Pretty exciting title to the Update by Chris and Jessy. That is a memory making moment in anyone's life -- the proposal -- and not often we get to share in it happening like it did by the vivid description, even to the special dessert event. Oh, how we wish them happy, agreeable days of planning the upcoming wedding day! Coni's chemo account was a masterpiece for being able to tell us all we wanted to know about her treatment, outcome, eventual wig, and the meaning of the words that were foreign to us. Thank you for sharing it all, even if it was so personal, but it was because you knew we are keenly interested in this research and study she is taking part in. No words could adequately express the relief and happiness and anticipation of the new job that Eric must feel. It sounds like a very comfortable company to be a part of, seeing it isn't such a huge one where you're not even noticed. The accounting department is a very important part of the working of the company. Ryan, your update of your job with Microsoft sounds like a profitable opportunity to become successful in your college major. Both Jessica and yourself will have some interesting Updates on your individual interests to share with us, we hope. I have a dear friend in Chile (from USA), so your choice to go has a special ring to it for me. What fun to see the picture of the snowshoe trio! Good thing you took that, as you just may not get them out like that again. Lots of work just lifting them up and down. Sounds like your crew were very well fed again. The best part was you not having to cook, right Donna Mae? Although that vegetable beef soup sounded wonderful. That baby sitting in the sink! I can just see the wheels turning in Bitzi's mind, to use that darling picture somehow. What big eyes you have, Austin! 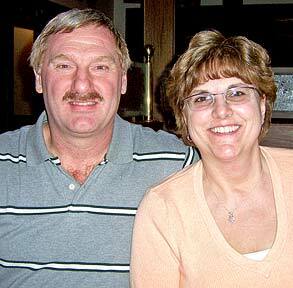 I have to pass on the GUESS picture this week, except for my good friends, Bill and Amy Dake. Larry, you just make us all the more anxious for your next chapter when you skip a week. Don't do that too often, as we really do miss the LTD Storybrooke. Sounds like the high and mighty officers have a humorous side, even if they keep it well concealed. But the little duck brought a forbidden smile out of one of them. Donna Mae, you have an experienced polisher and shiner upper there! Well, I was mesmerized with the story by Edward W. Miller! So very interesting, and hopefully, that will be the first of several chapters of the story. I saw that picture of August Miller, and before I had read the story I just knew that was a relation to the Johnson boys, but then I saw the name Miller so knew it couldn't be, but it is. The family resemblance passes on down through the generations in different ways. It was the eyes and shape of the face that was striking. Thanks, Jerrianne, for finding that story to share with us. I thought there was a page missing as I read it. It ended at just the place where we wanted to read more about the mill. I am so thankful I don't have to eat China food. It sounds so grotesque and they certainly were good sports to sample it. They use a lot of color -- even whole buildings lit up in different colors. Unusual street lamps. That looks like a thriving business that Ary has there. One is getting the fever for outdoors and flowers, etc., as each day warms up some. We love thinking Spring, although it brings with it lots of work on a yard neglected all winter. The pictures were taken 2/22/06, so that was very recent. Looks like Bachman's, doesn't it? Even if Roy isn't fond of cauliflower, I would love trying the recipe for the "Cauliflower and Green Onion Mash." I did try to barbecue chicken breasts, but substituted, so didn't give it the fair trial. I wonder if they are actually going through with the Mardi Gras in New Orleans this year? I wouldn't doubt that Bitzi made that hat -- or was that real hair? I forgot to report Tom Miller's birthday being March 2nd. SO SORRY, Tom. We had a tradition of going out to eat for our birthdays, so close together, and each one pay for the other one, ha. Families were along, too, of course. But, time and distance has brought an end to that event. He will always be a special friend to me, seeing we worked together for 13 years in his chiropractic office. Thanks again for The Bulletin this week. It was a special one, as they all are, really. I am making a special point to see that Roy reads this quotation for the day -- (smile). 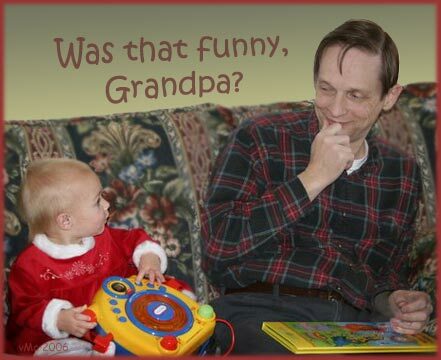 Carrie Horne shares a joke with Grandpa Ernie Dake.